Articles When can Catalans stop apologizing for being Catalan? When can Catalans stop apologizing for being Catalan? It was a terrible accident. My daughter was in an exchange program with kids from Dusseldorf last year, like the group that lost its life on Flight #4U9525 from Barcelona to Dusseldorf yesterday. My son is on a school trip this week. A friend lost his wife. I have flown dozens if not hundreds of times. The flight left from my home city’s airport. It’s way too close to home. I can’t stop thinking about it. It’s so sad. I confess I didn’t think quite so much about the Malaysia accidents. A little, but not as much. It’s true that I care more about people who are closer by, who I might know. I’m not sure if that’s horrible or just human. So, I understood perfectly well that people wanted to know where the people were from on the flight. The Brits said maybe there were British nationals, the Germans counted up their dead. Nobody thought it was unseemly. The Spanish Vice President, however, didn’t talk about Spanish nationals, but rather Spanish surnames, revealing her belief that you can tell if someone is Spanish by their name. Forget the millions of immigrants who have moved here, or people like me whose grandparents left this country a hundred years ago. Just focus on purity, like Spain has done for 500 years. And then the waves of anti-Catalan hate tweets began. “I think the plane accident is just fine if it was full of Catalans.” “Plane full of Catalans and Germans crashes in France. #winwinwin” “Come on, don’t get bent out of shape, it was just Catalans in the plane, not people.” “OK, I’m going to say what half of Spain is thinking: here’s hoping that those 45 Spanish surnames belong to Catalans, Basques and [despective term for South Americans]”. I can’t even bring myself to translate this garbage. Drets said they’ve received 1000 reports of anti-Catalan hate speech tweets relating to the disaster. “It’s only a few idiots,” said some. “Look at all the people repudiating them,” said others. Only 200 Twitter users out of 7.9 million said a third. But to ignore hundreds of anti-Catalan tweets every time there is a disaster (or a loss to FC Barcelona) is to ignore the reality staring people in the eyes. 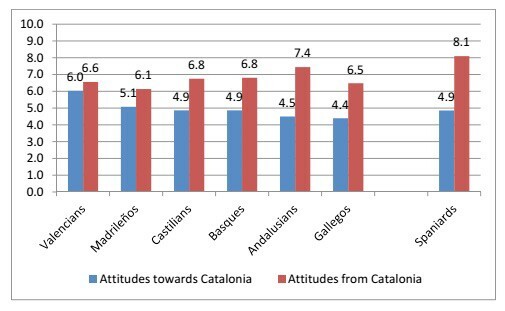 The reality reflected in Germà Bel’s book “Anatomia d’un desengany” [Disdain, Distrust, Dissolution] is that Catalans are the nationality viewed most negatively by Spaniards, receiving a score of 4.8 out of 10 on a scale of Terrible (1) to Perfect (10). 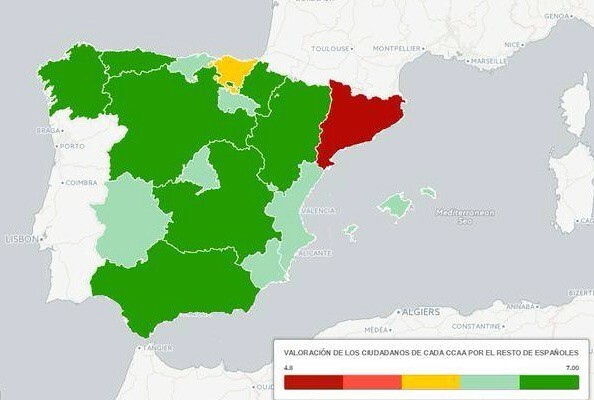 The Basques, the other powerful nationality within Spain were second to last with a score of 5.8, and all other regions received scores above 6, up to the popular Andalusians, who scored 7. It’s important to note that the feeling is not mutual. Catalans rate Spaniards at 8.09. A staunchly non-independentist Australian who has lived here for 30 years and who has traveled extensively in Spain asked me at a party recently, “Why do you think Spanish people hate Catalans?” Even he could see it. Later in the day yesterday, the Catalan President, Artur Mas, was excoriated for speaking in a press conference in Catalan and Spanish. Both. “Why is he speaking Catalan when Spanish is already enough?” “How can he be so disrespectful?” When Christianne Amanpour asked him later about who was on the flight the President said “We know there were some Spanish people, Catalan people” and that was enough for Twitter to roar again, just because he mentioned Catalan people. Nobody mentioned this time that he said it in English, and not Spanish. No other people is expected to suppress and hide their identity. Other countries — even stateless ones like Wales and Scotland — are allowed their flags, their football teams, their languages — but not Catalonia. But I’ve got to tell you: Catalans aren’t Catalan to spite anyone else. They just are. They don’t speak Catalan to bother anyone else, they speak it because it’s their language and it was the language of their parents and grandparents. The same reason I speak English. The French speak French because they’re French. The English speak English because they’re English. The Italians speak Italian because they’re Italian. The Catalans, however, speak Catalan to call attention to themselves, to discriminate and to ask for independence. That’s bad luck, huh? And it’s about time the world knew that many Spanish people just can’t stand it. They feel rejected by Catalans who don’t feel Spanish, they feel left out by Catalans speaking Catalan. And this feeling of rejection is compounded by the fact that Catalans have turned their back on the impenetrable power structures in Madrid from which they have been consistently excluded, and forged their own prosperous, progressive, inclusive country. The Spanish visceral answer is imposition, “It’s too bad if you don’t feel Spanish. Look at your passport, you are Spanish whether you like it or not.” Classic Brand Spain. The Spanish economic answer is a combination of cultural and financial asfixiation to bring Catalonia to its knees. “If we can get rid of the language and the culture, we can get our hands on the money forever,” they seem to think. This theory is working wonders in Valencia, where Catalan used to be the majority language, and where repressive education and linguistic policies have managed to reduce it drastically (see table below). What is most clear in these anti-Catalan tweets is a lack of respect. And it is precisely this lack of respect, this uncontrolled rage at the Spanish inability to erase Catalonia’s culture and language that is at the heart of Catalonia’s independence process. The most important issue is not the money, it’s not the trains, it’s not the endemic corruption, although those issues don’t help, it’s respect. Spain has none for Catalonia, and Catalonia may perhaps be finally done begging. If you mention any of these things on Twitter today, detractors say you are politicizing a tragedy. Must we be always silent? Must Catalans always smother their identity, hide their language, be “polite”? Since there are no monolingual Catalans, since they can always speak someone else’s language, be it Spanish or French or Italian, since they can always accomodate if they so choose, just when is it ok to be Catalan? My husband carried the Spanish name that was imposed on him at birth on his passport for 48 years. Will he also have to die in Spanish? 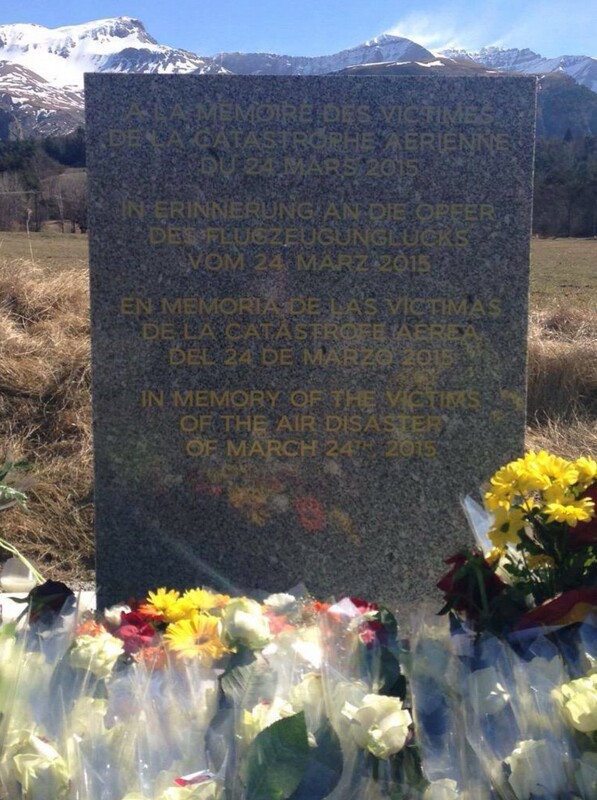 Epilogue: The monument to the crash victims today was to have the languages of the numerically dominant victims on it. Of the 50 citizens of the Spanish state, 39 of them were from Catalonia. Guess what language the Spanish government saw to it was not included with the others.